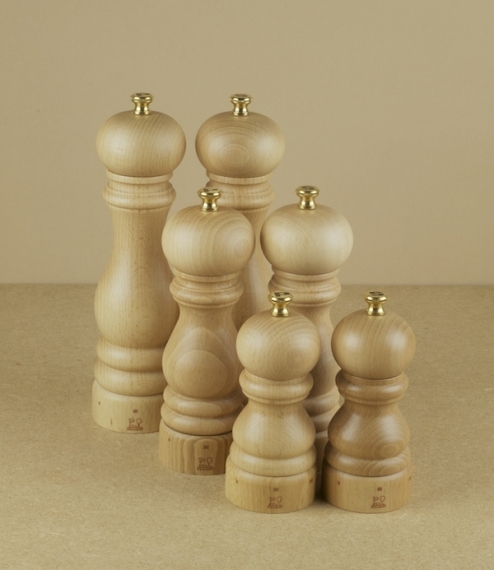 For over 160 years Peugeot, established in 1840, have been manufacturing pepper and salt mills. The patented adjustable mechanism uses two rows of spiral teeth, or two rows of helicoidal grooves, which first crack the pepper corns or salt grains, then grind them finely. The pepper mechanism is fabricated from high carbon tool steel and case hardened for durability and reliability, whilst those for the salt are of stainless steel for longevity. For generations these have set the standard for salt and pepper grinding everywhere. This is their Paris range, with a traditionally shaped lacquered beech body and a mechanism adjusted by loosening or tightening to topmost screw.